Landfills vary immensely, but even the most recently developed are not considered to provide a sustainable way of getting rid of rubbish. They can cause pollution, and certainly hold the potential to do so. Very few of us want to live near to them, and the methane gas produced by them is a major contributor to global warming. Consequently, waste policies have increasingly been based on a recognition of the need to move away from this method of waste disposal. Since around about 2010 the idea of not sending any waste to landfill has been becoming more and more popular, and the UK government (for England) the Welsh Assembly and the Scottish Government are all now committed to working toward “zero waste” to landfill. It Wasn’t Always Like This So How Did We Get to This Point of “Zero Waste” Commitment? 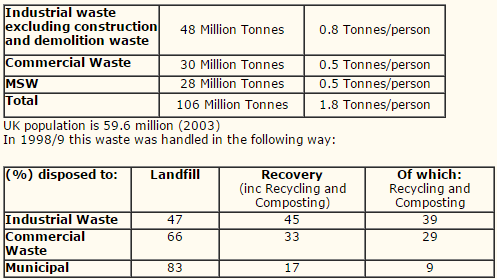 Until about 2005 about 85% of UK waste was being sent to landfill so how did policy change to set the target at zero. The first big step came when the EU enacted the Landfill Directives. Read on and we will explain that. The EU Landfill Directive 1999/31 came into force in the EU on 16 July 1999. For the most part, this law came into force for the UK, in June 2002, under the new Landfill (England and Wales) Regulations 2002. Introduction of waste acceptance criteria setting out types of waste to be accepted at each of the three types of landfill. The UK was been given four extra years by the EU to meet some of the requirements of the Directive because we were so dependent on landfill, and desperately lacking in the necessary alternative facilities for sorting the waste and recycling it. For compliance with the EU Integrated Pollution Prevention & Control Directive Draft Statutory Instrument 2000 No. How much waste do we produce in the UK?In the United Kingdom. on average each person throws away seven times their own body weight in rubbish each year (2004). According to a new report published by the European Commission, the UK remains outside of the EU’s top performers in terms of landfill diversion, despite significantly reducing the amount of waste it landfills. The EU’s best-performing member states include: Denmark, Belgium, Sweden, Germany and the Netherlands, who all sent less than 3% of their waste to landfill in 2010, in comparison to 48% of UK waste sent to landfill. The report did show, however, that the UK has nearly halved the amount of municipal waste per capita sent to landfill, with a reduction from 464kg, per person per year, to 259kg. Due to UK government spending cut-backs, and the fact that once landfill tax exceeded the cost of waste recycling and businesses started to recycle because it became cheaper, the rate of improvement in recycling rates has almost halted. Since, 2012 the UK waste management industry, lacking in any real government targets and with reduced funding, has stagnated. 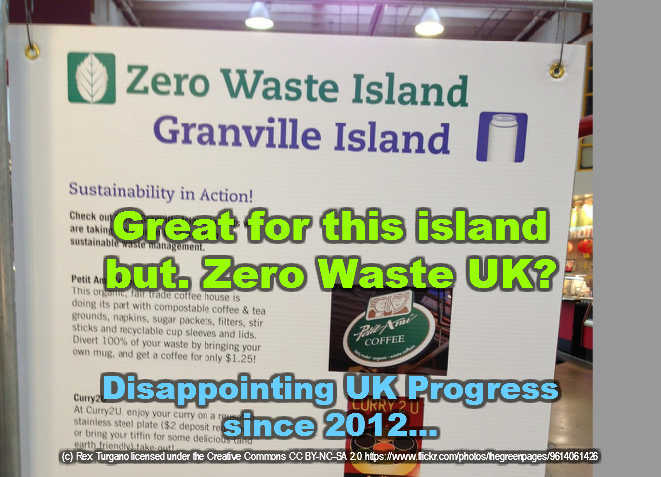 The coalition government has promised “zero waste” in England, but the reality is that this is no more than a pipe-dream while current reduced government spending and a lack of clear waste policy, continues.